The original Romanesque and Gothic church was rebuilt in 1784 and converted into a residential house with small apartments. It wasn't until 1985 that the crumbling building underwent a six-year renovation. The church was converted into a concert hall while preserving its original architectural qualities to the maximum extent possible. It is mainly used for concerts of Prague Spring. Should we take a turn from Karmelitská to Hellichova Street towards Petřín, we will come to a small former church of St. Lawrence (Sv. Vavřinec). 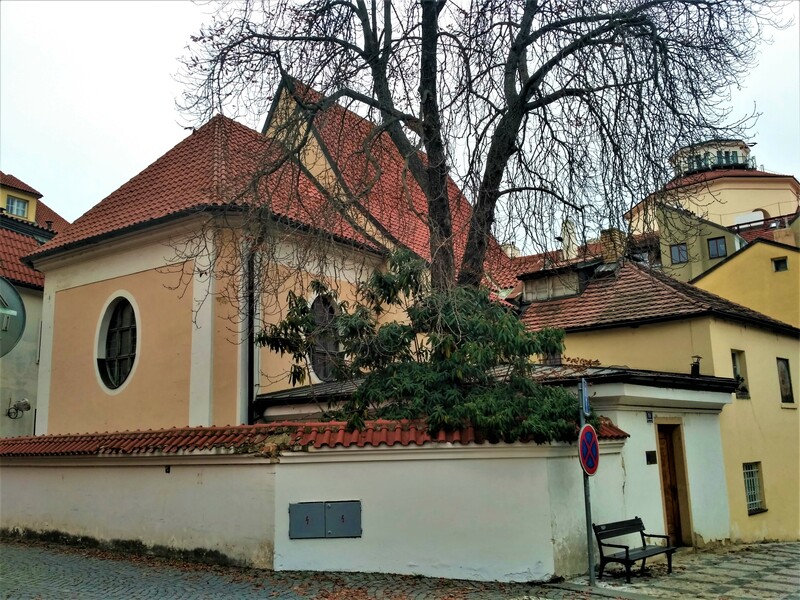 Before Malá Strana was established, this church was a part of the settlement named Nebovidy, and it was a single-aisle Romanic building from the mid-12th century. There was originally a tower between the square chancel and the church aisle. The fact that the church was built in Romanic style using Greek masonry was discovered quite accidentally around 1955 by dr. Vladimír Píša, who measured and sketched the church. The aisle was about 12 m long and 7 m wide. There were remains of two windows also dating back to the Romanic era, which were bricked in during later reconstructions. An extensive Gothic reconstruction in around 1378 added a side aisle to the church, with a cross vault and a sacristy. Around 1390, the interior of the church was decorated with beautiful paintings by an unknown author, who learned in the workshop of the Master of the Třeboň Altar. Among the most beautiful paintings, there is the painting of St. Dorothea and St. Lawrence, Virgin Mary and St. Andrew. The painting Martyrdom of St. Erasmus and St. Lawrence is conceived as Gothic, while the Birth of the Lord, Adoration of the Magi and Annunciation to the Shepherds belong to Romanic style. The wall paintings were discovered in 1988, when the Gothic plaster was exposed. After that, the remains of the paintings were restored. The interior was returned to its original beauty thanks to efforts of Mr. and Mrs. Látal together with other restorers.